It's so weird how random some of these bowls can be! Like earlier today I saw that the "Other Erica" pinned a pic of an Americana set with a blue background instead of the usual brown or white. So weird! The strawberries are very cute, but it would bug the heck out of me that they weren't marked. It's cute but since it's unmarked I would probably give it a skip. 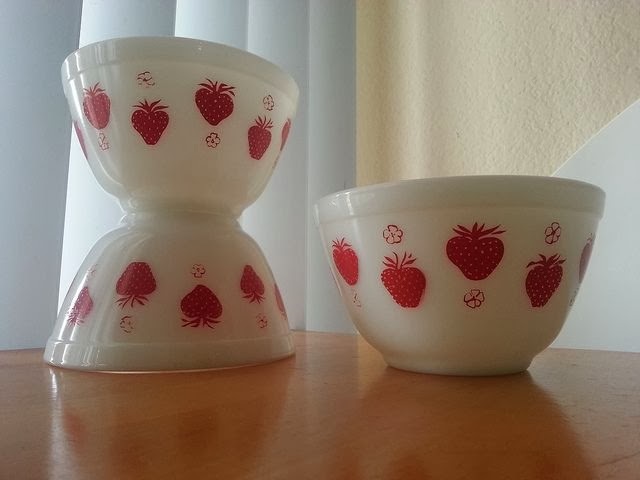 I have some really cute vintage tablecloths with strawberries on them so I probably would buy them IF they were a good price. But if I was drinking vodka and found them online I would most likely buy them without looking at the price. I should have a breathalyzer hooked up to my computer. I would buy those in a heartbeat!!! Love strawberries! I'm wearing a necklace with a strawberry on it right now!! Have a great day! Oh yeah, I was watching those. Kinda annoyed me the listing was ended--I wanted to see how much they would go for. Honestly, I didn't like them enough to consider bidding, though...it has got me thinking to bid on some of those auctions at the opening bid just to keep them from ending early!!! I'd be happy for one, I wouldn't care if it had a marking or not, I've never seen this pattern before. I think I agree that if I saw them in a charity shop or market, I'd pick them up, but wouldn't pay over the odds online before I saw them in real life. I'd buy them because I'm a bowl whore! I wish I could show you exactly what a floozy I am but can't upload :( LOVE THESE BOWLS!